Summer break for teachers is a dirty lie. Those who don’t teach always talk about how nice it must be to get three months of vacation time every year. Start with the fact that it’s actually only two months, three weeks are inevitably spent in required training or training you were duped into, and the remaining five weeks are spent overcommitting to people and plans because you feel useless without young minds to mold, and summer break adds up to nothing but an urban myth. I won’t trip though. My two months were well spent with family, friends, trips, music, and memories that will give me the steam to teach until Thanksgiving break. Though my summer slumbers were sometimes interrupted by visions of my trouble children haunting my dreams, I was glad to see them on my roster again—maybe not glad to see them in my 8th period, but glad nonetheless. I have a reason for this anticipation. While visiting home this summer, an older woman at church asked me what I am up to these days. I told her I was on summer break, and she—like all adults older than me and store clerks who eye me funny when I ask for the teacher discount—assumed I was still a student. I hear people tell me to be careful in Oak Cliff fairly often. If people don’t say it with their mouths, they say it with their shocked expressions when I tell them I teach there. If you aren’t from Dallas, you may not know about Oak Cliff’s bad reputation. One Google search of Oak Cliff on any given day turns up a litany of results about recent crimes in the area. Indeed, even my students—who are only 12 and 13 years old—are acutely aware of the perceptions surrounding them. I don’t know when the woman at church was in Oak Cliff, but she’s right about something: nothing stands still. Oak Cliff, when founded in 1886, was originally designed to be an elite neighborhood and vacation resort. Now, people call it the “wrong side of town,” both because of real issues it has but also because of negative stereotypes that reinforce those issues. I’m not ignorant enough to think that I am teaching in an elite neighborhood, but I am also not naïve enough to think that I am teaching on the wrong side of town. No, I am teaching in a place where—like any place on Earth—nothing stands still. My students are no longer the wide-eyed kids they were when they entered middle school last August. They have done some growing, some learning, and some maturing. They have made good choices, and they have made bad choices. They have made incredible gains and seen heart-wrenching losses. They are not really the same kids that I met on my first day of teaching. I am not the same kid either. Last year, absolutely everything that happened in class was the first time I had experienced it; now, I am a teacher with one year of experience in my supply bag. When I think about the person I was before teaching, I barely recognize that wide-eyed kid who had no idea how to handle a student crying or a parent conference. It is far too easy for us to believe that things are how they are and that they will never change. My least favorite idiom of recent years is the phrase used for seemingly uncontrollable moments: “It is what it is.” We all fall victim to the lie that life will always be how it is now, people will never change, and bad neighborhoods will always be bad neighborhoods. Nothing is as what it was yesterday. People are entering and leaving your life faster than you realize. The words you say today to your students, your children, or your friends are affecting who they will be tomorrow. That may seem scary, but there is comfort in knowing that all is temporary. The kid I sent to the office last year will be the kid who steps his game up this year. The grief you have held for months on end will fade in time, and you will see brighter days again. The anxiety you feel over a relationship or a job will be resolved. Our debts don’t have to carry over throughout our entire lives. This also means that the success we had yesterday doesn’t pay for today. I experienced a lot of proud moments in my first year of teaching, but I also saw my fair share of disappointments. I remember the looks on students’ faces when I told them they didn’t pass the STAAR. I remember the last day of school when some kids walked out of the door without shaking my hand or hugging me because I didn’t develop strong relationships with them. I carry those moments with me, and I know I have to do better tomorrow. Whatever season you’re in right now, whether joy or pain, remember that nothing stands still. We have to work a little harder every day to ensure that the stories we tell about ourselves and our communities are better than the ones we told last time. It will be difficult, yes. But at least nothing is static, and the page can always be turned. I used to believe a lie. Even though I am ultra-cool now to everyone who knows me (I can hear some of you snickering), I used to be uncool. Rather, I used to be ashamed of being uncool. In the 6th grade, I was bullied for being the scrawny nerd who believed he could play in the NBA one day and had an unusual affinity for rap music (specifically Nelly’s Nellyville). Most days I was called the names children still pass around like candy that’s been poisoned. Most days my mom took me out for lunch to let me breathe for 30 minutes. Most days I was ready to call it quits on school because of the pain that came with it. The lie I believed was not that I would be in the NBA; that didn’t pan out either, but I (mostly) got over that. There was a deeper lie that took root due to the bullying I experienced that year: I believed I did not have a voice. In the short span of one year, enough kids told me I did not matter that I started to believe they must be right. Time after time, when my teacher blamed me for painting a target on myself, she painted a picture of me that made me invisible. When an administrator told my mom, “Boys will be boys,” I wondered when I got to be one of the boys and not one of the victims. It was only the 6th grade. The year after, I started making friends again and the bullies left me alone. A few of them became my friends. But the small moments that happen to a child—or any human for that matter—can take root and grow into something massive over time. The movie Inception shows the power small ideas can have when they are planted deep in someone’s subconscious. I was only bullied in the 6th grade, but the effects lasted into adulthood. In high school, my theme song could have been Aloe Blacc’s “The Man” (you know, the one that goes, “I’m the man, I’m the man, I’m the man”). I was class president, valedictorian, and involved in any club or organization that even remotely interested me. I don’t say any of this to brag; no one cares what you did in high school starting the day you graduate from high school. I say this because I used to think I had lived out the quirky indie movie about the middle school dweeb-turned-high school cool kid. I thought I had lived the Cinderella story and my underdog roots would carry me through life. I was convinced that I was a real-life Michael Cera. When we are young, we can be pretty dumb. As soon as I got to college, my social 180 took a spin in the other direction. I realized I had not really emerged from my cocoon of uncool. I commuted to school and found it difficult to fit into the social scene at my university. Instead of digging my heels in and trying harder, I started remembering that voiceless 6th grader that faded into the background of everyone’s minds and concerns. It’s not something I like to think about or talk about a lot, but on my lonely commute to and from school, I used to imagine a world without me. I would think about how people would go on living after I was dead. I wondered how much I mattered, and I started to believe that lie about myself—the one about how I was voiceless, powerless, and ultimately worthless. I don’t want to spend too much time talking about that dark period in my life, but I do want to talk about the other side of it. After hitting my version of rock bottom, I took stock of my life and started digging deeper so I could climb up and out of the hole years of insecurity and false security had made. I added a Writing major to my Religion major, and began writing stories that helped me process what I was dealing with internally. I started being a better friend to people who had been there all along. Slowly, I survived the storm. As Ben Dolnick writes in the novel You Know Who You Are, “the amazing, ordinary thing happened: time passed.” There were certainly other factors that pulled me from the depths of my insecurity, but they all happened because time allowed them to come through for me. In ten weekdays, I will finish my first year of teaching. This year, I have taught about 100 students who are just a bit older than I was when I was first told I was voiceless. Interacting with them on a daily basis, I have made it my mission to let them know that they have a voice. I cannot give them their own voice, but I can help them find it. It is a hard task. My students are dealing with social pressures that I never conceived of at their age. There are a variety of factors that contribute to this reality, from the fact that they are dealing with their racial identity at a much earlier age than I did to new technology we as adults don’t even know how to use. My kids are constantly inundated with messages that tell them they, too, are as voiceless or more voiceless than I was. I wanted to tell you that I found the key to loving people in such a way that they know they have a voice. I wanted to tell you I unlocked a secret in my first year of teaching that most of us spend a lifetime searching to be told. I did not find that magic solution. However, I will tell you this: I am alive. I know that is probably shocking news, so I will give you a moment to process. I have been thinking about the 6th grade a lot this year. I have been thinking about what it felt like to be voiceless, to feel like I didn’t matter. I have been thinking about how it felt to experience that again in my early adult years. Lately, I have also been thinking about how I survived those years, those trials, those moments when I felt like I wouldn’t make it, to be alive right here and now. I stand in front of a classroom of middle schoolers every day, and I tell them they matter both through my words and my actions. 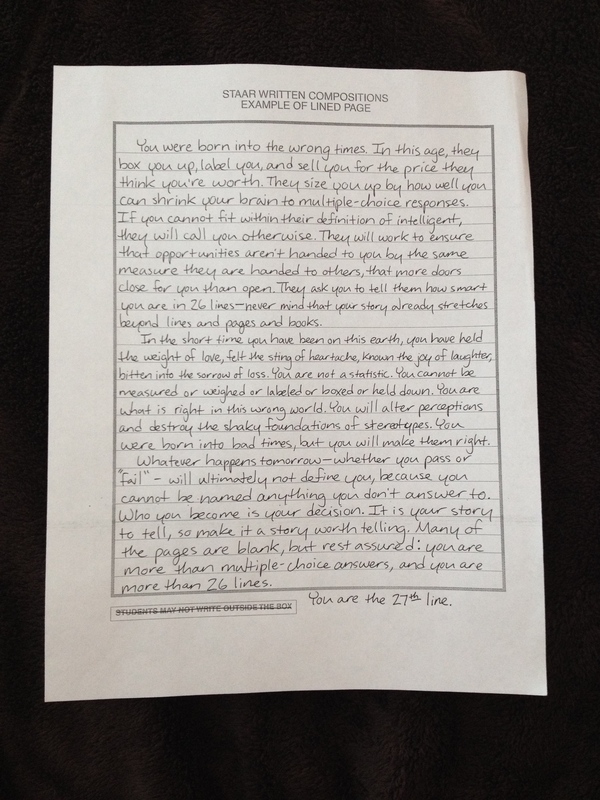 I wrote a blog post about how we are all the 27th line, and almost 55,000 people read it. Many shared it with their children or students to let them know they matter. I perform my rap music every month in the same room I have seen my favorite bands play. I drove home this weekend to tell my mother I love her. I know a group of very special people who I love through stupid jokes and fun adventures. How did I come to believe I have a voice? I am alive, and that has made all the difference. Woody Allen once said that “80% of success is showing up.” I have showed up to life every day for over 23 years, I did a few things right here and there, and I started becoming acutely aware of how far my voice truly carries. In this moment, your voice is carrying a lot farther than you realize. You never know what showing up will accomplish. There are people all around you who need you to believe the incredible truth that you are alive. This past week, I received a note from a student for Teacher Appreciation Week. He is one of my English Language Learners, and he wrote that since I became his teacher, he is no longer afraid to write, but instead has started to learn its importance. I hope that you stop being afraid of not mattering and start learning that you matter. I hope you know that you are alive right now, and someone needs you to remind them that they are alive too. I hope someday we don’t have to be told we are alive, because we will all just believe it from a very young age. Until that day, wake up every morning, look in the mirror, and say, “I am alive.” Believe that, then use it. You won’t get it right every time, but every once in awhile, something amazing will happen. Live for that moment, then go after the next one. You will be surprised by what happens to those who believe the truth that they are alive. If you like this post, scroll to the bottom to follow my adventures in teaching and life!